Young Magpie Tom Langdon has not played senior football in over a year, but now, at last, it appears he has turned the corner in his recovery from injury. The new generation of Magpies continues to gain recognition from the wider football public. Collingwood continues to secure its promising youth, with reliable defender Tom Langdon putting pen to paper on a three-year contract extension. An unflappable defender who took all before him in his first season of league football. Langdon, who was plucked from the TAC Cup late in the 2013 National Draft, managed 19 senior games in his first year in the AFL system and was rewarded for his efforts with the Harry Collier Trophy as Collingwood’s best first-year player in 2014. He wasn't impacted by second-year blues, either, for he was one of just four Collingwood players to play all 22 games in 2015. Unfortunately, injuries to his knee and ankle ruined his momentum. After playing 41 of a possible 44 games in his first two seasons, Langdon featured in just 16 of the 44 that followed. At long last, he made his return on the Queen's Birthday of 2017 and held his place for the remainder of the season. With a cool head, an obvious ability to read the play and clean disposal, Langdon will be eager to build on the gains made in late 2017 next season. It’s been a challenging two years in the life of Tom Langdon. 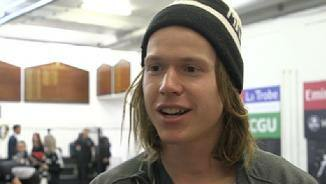 He played 41 of a possible 44 games in his first two seasons on the Collingwood list. In the 44 that followed, he managed just 16. Injuries to his knee and ankle early in 2016 put the stoppers on a career that had flown to its 46th game, and by the time he ran out for his 47th on the Queen’s Birthday, it had been more than a full 12 months since his previous senior appearance. Three VFL games at an average of 27 disposals after ANZAC Day convinced the match committee he was ready to play again, and he was not ousted from the senior side beyond his round 12 recall. As the year wore on, Langdon worked back into his groove across half back, averaging 21.6 disposals in his last five games. It’s a form line he will be hoping to maintain and build upon once the 2018 campaign begins. 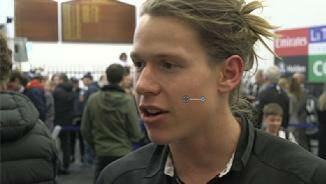 Since his debut out of the blue in round one, 2014, Tom Langdon has been a part of the furniture in Collingwood’s starting 22. Rarely highlighted in pre-game matchups but always reliable, Langdon played 19 games in his first season before another 22 in 2015. This season, his career hit a snag for the first time. The defender played in round one as expected, collecting 17 disposals in Collingwood’s heavy SCG loss to the Sydney Swans. However while many Magpies were performing below the expected level, Langdon’s star was rising in the early games of the season. He had 27 disposals and kicked a goal against St Kilda in round three and added another 26 touches the following week in a loss to Melbourne. It was here where the injury troubles begun. A late change saw him miss ANZAC Day for the first time in his career, before a collision the following week saw the 22-year-old leave Perth’s Domain Stadium with an ankle injury. He wouldn’t return for the remainder of the season as rehab became complicated and clouded by other concerns. 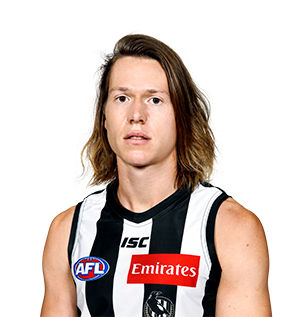 Despite knee surgery in the pre-season, Langdon was forced to go under the knife again in late-June as hopes of a late-season return slipped away. Langdon raised his career games total to 41 by being one of just four Collingwood players to take part in all 22 games in 2015. His composure and maturity continued to defy his status as just a second-year player and on many occasions in 2015, Langdon showed the poise of a much more experienced player. Stationed in defence for the majority of the year, Langdon provided both accountability and rebound out of the back line. His best game of the season arguably came in round 15 when he combined seven tackles and seven rebound 50s with a 23-disposal display in Collingwood’s narrow loss to Port Adelaide. The performance was followed up with a career-high in possessions a month later against Carlton before Langdon managed to keep his disposal average about 20 in the final month of the season. While many players struggle to establish themselves in the early stages of their careers, Langdon has now missed just three home and away games in his first two seasons at the club. It’s not just inside the four walls at the Holden Centre where Langdon is highly regarded. In September, he was named in the AFL Players Association’s 22Under22 Team of 2015 which recognises the best young players in the competition. An excellent first season for the composed young defender. Langdon stepped into the breach left by the often-injured Nick Maxwell and made the third tall defender spot his own. He was second in the AFL for intercept marks up until round 15. His ability to read the play and use the ball under pressure drew comparisons with former Magpie champion James Clement. 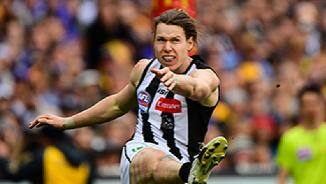 He is likely to be a permanent fixture in Collingwood’s defence for years to come. A medium defender/midfielder who came of age in 2013. His balance, game sense and ability to read the ball in flight give him a significant advantage when the ball is in the air. A strong overhead mark and fluent kick of the football on his preferred right foot, his ball use is smart and consistently finds its target. Played senior football for VFL club Sandringham for much of last season after being overlooked in the 2012 National Draft. Selected at No. 65 in the 2013 National Draft.